Introduced in 1956, this style with coordinating ottoman is one of the most recognizable of the Eames chair designs. It has been made continuously by Herman Miller since it was first put into production. "The Eames Lounge Chair and Ottoman debuted on national television in 1956. Charles and Ray Eames appeared on the NBC television network Home show hosted by Arlene Francis. Stardom ensued for both design and designers. Yet, as popular as the lounge chair and ottoman have become, they remain grounded in the handcrafted details that continue to distinguish this classic, authentic design," according to the Herman Miller website. One of the features that make this chair so comfortable is the way the seat is permanently tilted to take the weight off the sitter's lower back and spine. The first chair and ottoman were crafted of molded plywood bases and finished in black leather with button tufting. The original versions made by Herman Miller in the mid-1950s touted "soft, wrinkly leather and plush down feathers" akin to more traditional upholstered chair styles. One clue that a similar chair may not be an original is if it reclines. This design was made to rest in a reclining position without adjustment. If a similar chair has an actual reclining mechanism, it is not an authentic Eames piece. Most replicas of the Eames Lounge Chair will not fit the original specifications of the design. They are, in fact, usually larger and somewhat clumsier. An authentic chair in this style will measure 32 inches from the floor to the top of the headrest. Many replicas will be several inches to 10 or more inches taller than an original. The front seat edge will be very close to 15 inches above the floor (and some replicas, like the white model shown in the photo, meet that specification). Also be sure to measure the distance across the arms and from front to back. Each of these areas will be 32.75 inches in an authentic Eames Lounge Chair. Deviations from these measurements can be an indication that your chair is not authentic. Eames Lounge Chairs were all marked with one of several different types of paper labels when they were new. Some of these just state that the chair was made by Herman Miller, while others provide patent information. Sometimes the labels are located under a cushion if you don't find them on the underside of the chair. However, these types of labels can be removed or fall off for one reason or another over time. Looking at other details can play a part in determining whether or not a chair you are contemplating is the genuine article. For instance, there should be no exposed screws in the three molded plywood shells that make up the outer body of the chair. You can also date these loungers by looking at the number of layers of plywood that were used in construction of the shells. Vintage chairs will have five layers, while modern versions have seven. Studying chairs you know to be genuine Eames loungers will go far in honing your replica-detecting skills. Going even further to learn characteristics of vintage pieces will help you learn to date them as well. The legs of a genuine Eames lounger have a bit of an angle (rather than being steep), and they are not flat. Often replicas will have a base constructed with square feet that do not adjust, or, the feet may be steeply inclined. In addition, an Eames lounge ottoman will have four legs coming from the base, not five as seen in copies of the design. Herman Miller currently offers the Eames Lounge Chair and Ottoman in a variety of leather colors with coordinating woods. Vitra, a Swiss maker of modern-style furniture, has produced this design (along with others) for distribution in Europe and the Middle East. These are not copies or reproductions since Vitra was authorized to produce the furniture using the original Eames specifications. One thing all these new production chairs have in common is the price. Depending on the materials selected, they sell in the $5,000-$6,500 range. 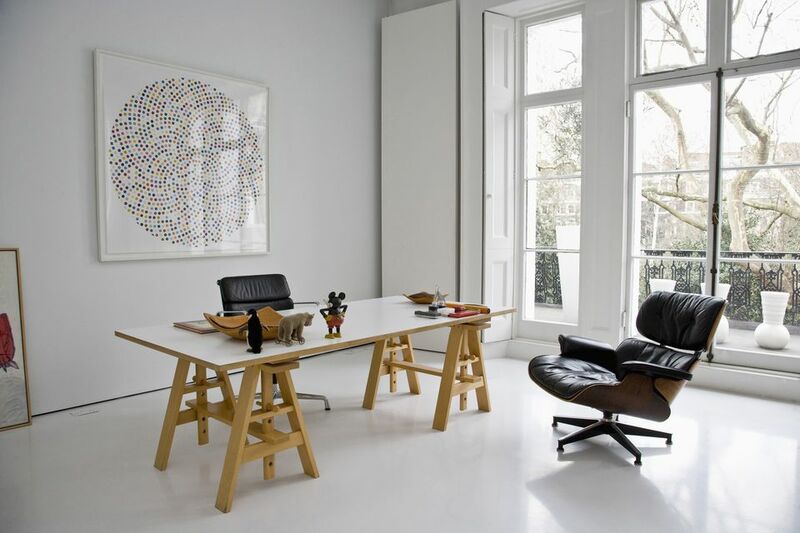 Vintage examples hold their value well, as does Eames furniture in general, and often sell in the same price range as new chairs. 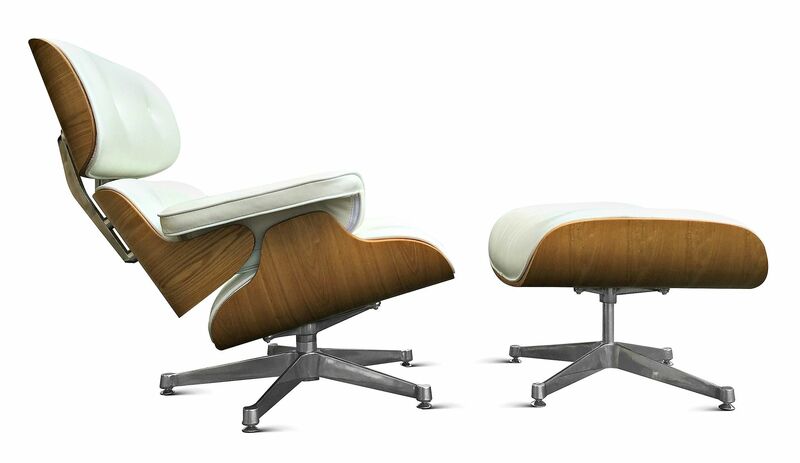 Replicas of the Eames lounger usually sell for $1,200-$1,500 and far less when used. If you see a chair you think is authentic at a too-good-to-be-true price, be sure to look further for signs that will confirm whether it is a replica or the real deal. How Much is Eames Furniture Worth?